In the basic school, I was taught that half of genome is received from father and another half comes from mother in the form of double-helix DNA, whose first helix consists of dominant nucleotide bases and second helix is a kinda inverted copy of the first helix. I feel like 3 different concepts are mixed here into one DNA spiral and I cannot sort them out. Can you explain exactly how is every concept (parent material, recessive genes and complemenrary nucleotides) are represented in the DNA? The professional and wikipedia explanations are too full and I cannot extract this basic information from too much detail. and where are they located? Are these just two DNAs which exist only during meiosis, during first moments of fertilization? How do you end up with only one DNA in the end? I would also like to know if individual's eggs DNA is coming from his own DNA or is formed in parallel, from his parents' DNA? That is, when individual's eggs' DNA is produced: during fetation of the parent, during his lifetime from his DNA or during fetation of the child? I think you really need to go back to the very basics and try to understand the DNA molecule, what a chromosome is, DNA replication and mitosis, what homologous chromosomes are, what non homologous chromosomes are, what sister chromatids are, what non sister chromatids are before you attempt to understand meioses. And I would definitely recommend you learn all of these things well before you attempt to understand molecular inheritance, but let me see if I can at least begin to clarify some of your misconceptions. If you are having a hard time understanding the concepts as written, try looking up the articles on Simple English Wikipedia first. The try to make their articles easier for novices to understand. There is no such concept as Dominant Nucleotide Bases. The two strands of the DNA double helix are complementary and antiparallel. Genes can reside on either strand. You are also getting really mixed about recombination via crossing over in meiosis. The chromosomes that are being recombined in the mother are from her parents, so technically the chromosomes that are being recombined are the grandparents chromosomes. The same is happening when the father produces gametes. The chromosomes from his parents are swapping pieces of DNA. At the end of meiosis, each gamete has a random assortment of 23 chromosomes, either from the father or the mother of the adult male or the father or the mother of the adult female. The 23 can be recombined meaning that the chromosome is part grandma and part grandpa, or it is a grandmother's chromosome that has not recombined or a grandfather's chromosome that has not recombined. Just looking at the possible ways that 23 chromosomes can randomly assort without taking into account recombination to produce a gamete, there are about 8 million combinations. Add recombination and it gives you a huge amount of genetic diversity. So those are the haploid gametes. When fertilization occurs the sperm from the father donates its random assortment of 23 chromosomes and the ovum from the mother has 23 randomly assorted chromosomes of its own. 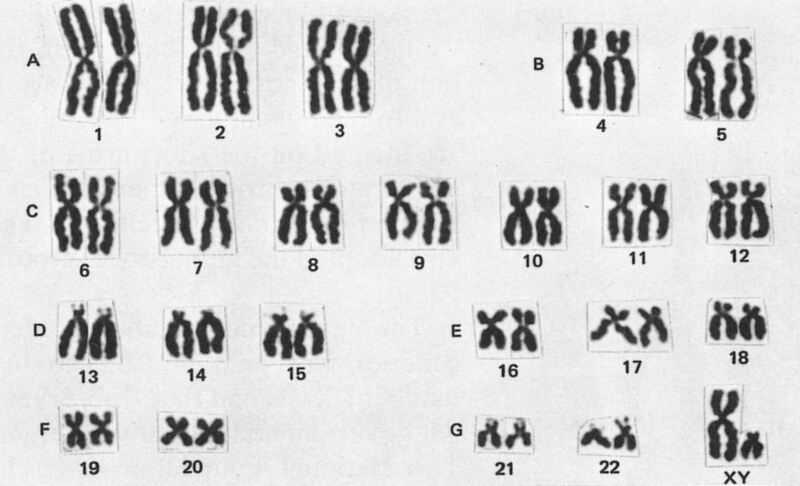 This gives you at total of 46; 23 from the father, made up of a random assortment of chromosomes from his father and mother (or chromosomes recombined by crossing over to be part his mom and part his dad), and 23 from the mother with the same pattern of random assortment and recombination. Also, the double helix doesn't dissociate (come apart) during crossing over [NOTE: for those who know, please do not jump on me for not explaining strand invasion here and the need for homologous sequences for crossing over]. One part of a grandparent's chromosome is exchanged for the exact same part of a chromosome from the other grandparent's chromosome, assuming normal cross over events. The alleles (versions) of the genes in that segment may vary, which is why you have a chromosome is part grandmother and part grandfather. As for dominant autosomal genetic traits versus recessive genetic traits. A dominant trait means that a heterozygous child will express the phenotype even though they only have one copy of the dominant allele. If it is a disease, then we say the person is affected. If it is a recessive trait, then the heterozygous child will not express the phenotype, so they are not affected by the disease, but they carry the allele and can pass it on to their children. This person is said to be a carrier. If a person is homozygous for a recessive trait, then they will be affected by the disease and show the phenotype. As for inheritance, you have to draw the punnet squares. This will show you the different patterns and probabilities of inheritance. I think that you are getting confused by the idea that you inherit one set of 23 chromosomes from your mother and one set of 23 chromosomes from you father. While this is true, meiosis happens in their reproductive organs before fertilization (for the most part, but the important part happens there and then). The example of the father is easier. He has two sets of chromosomes, one set that he inherited from his mother and one set he inherited from his father. At the beginning of meiosis all 46 chromosomes replicate. They make an exact copy of themselves and are joined at the centromeres. You have 2 sister chromatids on each of those chromosomes. Now the the homologous chromosomes will pair up, so one of the chromatids on the paternal chromosome (say chromosome 4 from Grandfather's set) will join with a non sister chromatid from the maternal chromosome (Grandmother's chromosome 4). So you have four chromatids from chromosome 4 lined up at the metaphase plate. The two non sister chromatids that are joined will recombine when the kinetochores move along the microtubules towards the poles of the spindle. At the end of all of this you have two cells that contain 23 chromosomes, each with a sister chromatid, however the sister chromatids are no longer identical because one of them recombined with the the non sister chromatid of its homologous chromosome. The thing you must remember is that each chromosome assorted independently of the other. For Chromosome 1 the maternal chromosome may have gone to the left cell while the paternal chromosome went to the right. Then for chromosome 2 you might have the maternal chromosome go right and the paternal chromosome go left. And so on and so forth. The number of possible combinations of how you can arrange two sets of 23 chromosomes is 2^23 or about 8 million different combinations. During meiosis II the 23 chromosomes again line up at the metaphase plate and they are attached to the spindle by both sides of their centromere / kinetochore complex. When the migrate the two sister chromatids migrate towards opposite poles. Again it is completely random as to whether the recombined chromatid or the chromatid that did not undergo recombination will migrate to the right or the left. Again, there are 2^23 possible combinations for EACH cell. So you end up with an incredible amount of genetic diversity on how chromosomes are assorted within the gametes. You will still only have four possible outcomes in the copies of any single gene that you get. You will inherit either your paternal grandfather's copy or your paternal grandmother's copy and you will inherit either your maternal grandmother's copy or your maternal grandfather's copy. That is why if a genetic disease is caused by one gene, it depends on which copies you inherit. I will talk about humans only and I will not talk about the special case of sexual chromosomes (and anomalies such as trisomy 21) from the answer just to keep things easy. There is a lot to say, so I am just making a very short overview of different subjects. Get some coffee first, read slowly and don't hesitate to click on the wikipedia links to further your knowledge. You'll note that the 23rd pair is the pair of sexual chromosomes but I won't talk about them. Note by the way that species that have chromosomes present in pairs are called diploid. Some species are haploids (not pairs), some are tetraploids (4 chromosomes of the same type together), etc... While the terms "diploids species" is often used to refer to mammals for example, it is actually more correct to talk diplontic species. Diplontic species, are those species who are diploid most of the time and haploid only for a short period. Our ovules and spermatozoids are indeed haploids. Chromosome are more-or-less X-shaped. Each "vertical line" of the X is a double stranded (double helix) chromatids. Two chromatids of the same chromosome are called sister chromatids. Two chromosomes of the same pair are called homologous chromosomes. Note that chromosomes don't always look as they are represented here, it depends on the phase during the life cycle of the cell but this is a story for another time. As you said, one chromatid is made of two strands that are "anti-parallel". The point of the junction in the center (although it is note always in the center as you can see) of the X-shape is called the centromere. Crossover is the process by which two chromatids from different homologous chromosomes exchange their DNA. Chromatids do not merge into one (as suggested in your below comment). Look at the above picture. Top left are the two homologous chromosomes. 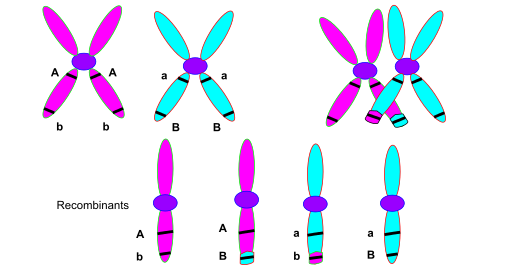 Top right are the two homologous chromosomes after crossover (a little pink piece is now attached to a blue chromatid and vice-versa). In the bottom are the four resulting gametes (the 4 independent chromatids) after meiosis. While crossover refers to the mechanism, recombination refers to the statistical association between two loci. On the above picture there are two loci represented and both are heterozygotes (see below for definition) as at one locus are the alleles aA and at the other locus are the alleles bB. Of course, on the sister chromatids both alleles are the same given that the two chromatids are just copy of one another where one comes from one parent. Therefore, a is always with b and A is always with B on the same chromatids. In the absence of crossover, we say that they segregate non-independently. If the offspring get A, (s)he will necessarily get B as well. However, if crossover can occur in between the two loci, then some gametes can carry a and B and some others can carry A and b. The statistical association between two locus is referred to as recombination. the recombination rate between two loci indicates the rate with which a crossover will occur between these two loci. When talking about DNA, we usually refer to one double helix (one chromatid). 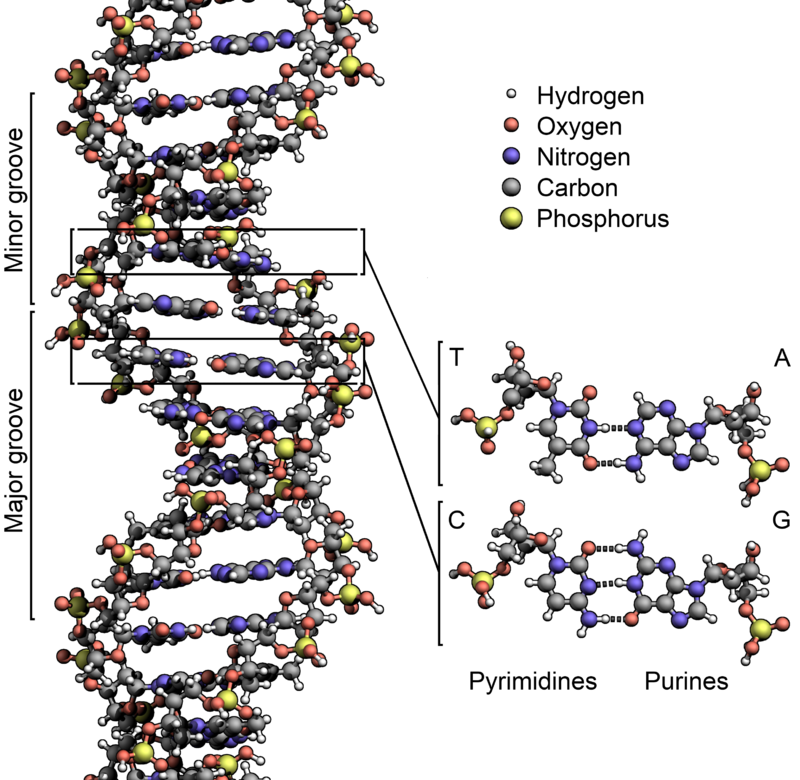 DNA, is made of different chemical compounds including the nucleotides. There are 4 types of nucleotides that we are reffering to by the first letter of their names, A, T, C and G. Every time there's a T on one strand there is a A, in the other strand (and vice-versa). Every time there's a G on one strand there is a C, in the other strand (and vice-versa). In consequence one strand is some kind of a negative (photography) of the other strand. You can refer to a position on a chromosome as a locus. At different loci are different types of sequences. Without going into the details, a gene is a type of sequence that is used to make a protein. In order to make a protein from a gene, the double helix has to open up over a short region, some proteins come, read the DNA and make up an RNA out of it. The RNA is some kind of negative of the DNA strand that has been read (except that the Ts are replaced by Us). From the RNA some other mechanism (ribosomes; ribosomes are actually made of other RNAs but this is also a story for another time) make a protein our of the RNA. Here is an extremely simplified schema of this process. As I said above, there are some differences between homologous chromosomes. Consider for example that in a population, at a given locus (let's assume this locus correspond to a gene for simplicity) different chromosomes carry different variants. These variants are called alleles. The words recessivity, additivity or dominance refer to the relationship between two different alleles at the same locus in terms of how the two alleles affect the phenotype. Referring from wikipedia A phenotype [..] is the composite of an organism's observable characteristics or traits, such as its morphology, development, biochemical or physiological properties, phenology, behavior [..]. Let's call one allele Aand the other allele a. Given that one individual has two chromosomes, this individual at the locus under consideration can be either aa, aA, Aa or AA. The difference between aA and Aa is that in one case the A allele comes from the mother while in the other case it comes from the father. It essentially makes no difference, so let's just call these two types aA. a and A are said additive if the phenotype aA is the average phenotypes between the phenotype of aa and AA. If the phenotype aA is closer to the phenotype AA than tow the phenotype aa, then A is said to be partially dominant and a is partially recessive (or vice-verse for the opposite scenario). In the extreme case where the phenotype of aA is exactly like the phenotype of AA, then A is said to be dominant and a is recessive (or vice-verse for the opposite scenario). Overdominance is a third type of relationship where the phenotype of aA lies outside the range of phenotypes of aa and AA. Such as for example individuals having both aa and AA genotypes are small while individuals being aA are big. Btw, AA and aa individuals are said to be homozygous while aA are said to be heterozygous regardless of the functional relationship between the two alleles. Consider for example a disease that is expressed only in the aa genotypes. In such case a is recessive. If two AA individuals mate together there is no risque for the child to carry the disease. If one aA individuals mate with a AA individual the child is either aA (with probability 0.5) or AA (with probability 0.5). If two aA individuals aA mate together, than a child is aA (with probability 0.5), AA (with probability 0.25) or aa (with probability 0.25). In other words, if two heterozygotes individuals mate together, they have a probability 0.25 that a given child will carry the disease if the disease is recessive. 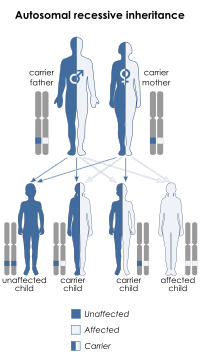 This probability reaches 0.75 if the disease is dominant (but the two heterozygote parents would both express the disease as well). Not the answer you're looking for? Browse other questions tagged genetics dna meiosis or ask your own question. Does one parent transmit more DNA to the offspring than the other one? How to calculate relatedness in haplodiploid organisms (mainly full sisters and full brothers)? Can I figure out the identity of my grandparent from this information? Do chromosomes change with time?